If Pitch Perfect was nonfiction, it totally could have been filmed on UChicago’s campus. Voices in Your Head placed second at the International Championship of Collegiate A Cappella (ICCAs) this spring, and first-year member Shubha Vedula took home the Outstanding Soloist Award. The finals were held at Beacon Theatre in New York after months of prep work and a long series of qualifying competitions. (The Midwest Quarterfinal was hosted by Voices in Your Head in Mandel Hall in January, which also brought film crews to campus for Sing It On, a new reality TV show that follows collegiate a cappella groups.) Their winning set—a mix of “Show Me How You Burlesque,” “Heroes Listen,” and “Bang My Head”— was arranged by group members and featured tight choreography, microphone tricks, and stellar solos. Since then, the group has reached new audiences in an NPR special about collegiate a cappella and had a brief moment of glory on the Today show. Voices in Your Head was just one of many collegiate vocal groups—there are eight on this campus alone—until 2012 when the group suddenly drew national attention by placing fourth at the ICCAs. Four years later, they proved it was not a fluke by being only six points short of first place at the Finals. Kevin Qian, a graduating fourth-year and the group’s business manager for the past three years, has been along for the whole journey. He’s one of only two fourth-years—the other, Mason Heller, is the group’s president—who remain in the group, despite coming in with nine other students in the fall of 2011. 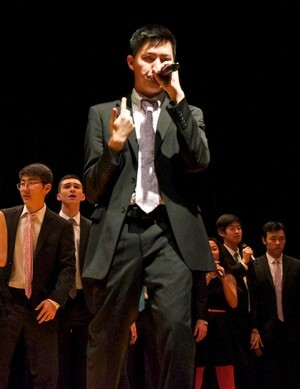 Kevin is an award winning vocal percussionist—a cappella jargon for beatboxer—and tenor who also produces recordings for the group and on his own. In high school in Massachusetts he was a “music geek.” He arrived on campus at an opportune time, just after the group’s beatboxer graduated. “I had learned to beatbox from my high school a cappella group so it was just a skill I kept refining, and [I] made sure I had that ready to give me an edge in auditions.” That helped buy him a ticket into the group at the beginning of their breakthrough season. This year’s success seems to bring it full circle. Chicago Maroon: Did you see your success this year coming? Kevin Qian: It’s kinda hard to see it coming because you never know. There are a lot of great a cappella groups across the U.S. and throughout the world, in the collegiate world….We never really achieved that high of a level in ICCAs before 2012…. People were like, “ Wow, this is Voices in Your Head.” A lot of groups really come out of nowhere…. But this year we had a really great talent pool. We have one member [Shubha Vedula] who was a former contestant on American Idol. We have a championship beatboxer, who’s also a first-year. We have a really great bass, and we have a great whistler, a great baritone, a great alto who [also] arranges a lot for us. That combination worked really well for us, but ultimately it’s what you do with the raw talent that helps you achieve success. CM: Tell me about rehearsals. KQ: Our normal rehearsal schedule is three days a week for two hours each—so six hours of rehearsal a week—typically Sunday and two other days in the week, although do tend to ramp up before concerts or competitions…. [At rehearsals] we warm-up first. We rehearse any songs either we need to do for a gig that’s coming up or learn new material. Sometimes we rehearse with our sound system, which is awesome. We have a really good sound system for the entire a cappella community: It’s 14 wireless mics and subwoofers and speakers and everything. CM: How have you seen the group grow and change in your four years? KQ: Well, one thing that hasn’t changed…is that I think the group has always been really passionate…. The biggest thing that’s changed is obviously membership. We cycle through new members every year with new auditions, and I think with every coming year the group just becomes more of a family. We still are really close…even with alumni and people who are no longer in the group. [And] just like UChicago—every year [it] gets progressively better on paper with SAT scores or whatever—I feel like with Voices, the talent, every year it gets better and better… which is also great to have an upward trend in that. CM: Have you been able to pursue your passion for music more seriously in college? KQ: [The] University of Chicago… it’s not like Northwestern or Berkeley where people come to study music and yet there’s such an awesome and growing talent pool here. I love collaborating with musicians here, either with people in my a cappella group or just random friends that I make. I have a home bedroom studio and…I do have a Soundcloud, and I like to record and produce my own covers in my spare time. I’ve also gotten in songwriting. Everything for right now is just a hobby, but I’m hoping to pursue that a bit more seriously after graduation. CM: Do you feel like Pitch Perfect is representative of what it’s really like? CM: Glee and the reality TV show the Sing Off first started grabbing attention for a cappella in 2009 and since then the hype has taken off with Pentatonix and the Pitch Perfect movies. What’s it like being around at this prime time for a cappella? CM: And as for seeing the group come so far? KQ: When I got in as a first-year I knew they were great…but I had no idea that you know that four years later I’d be performing in the Beacon Theatre in New York. It’s incredible. I can’t say I expected that. I just auditioned for an a cappella group because I love music and so did everyone else in our group. So it’s just great to see what we’ve accomplished. And I’m really proud, a really proud senior. Kevin hinted the spring concert might include a cool light show accompanying a new song, along with a live performance of the ICCA set, his senior solo, and a loud crowd of alumni cheering the whole way.